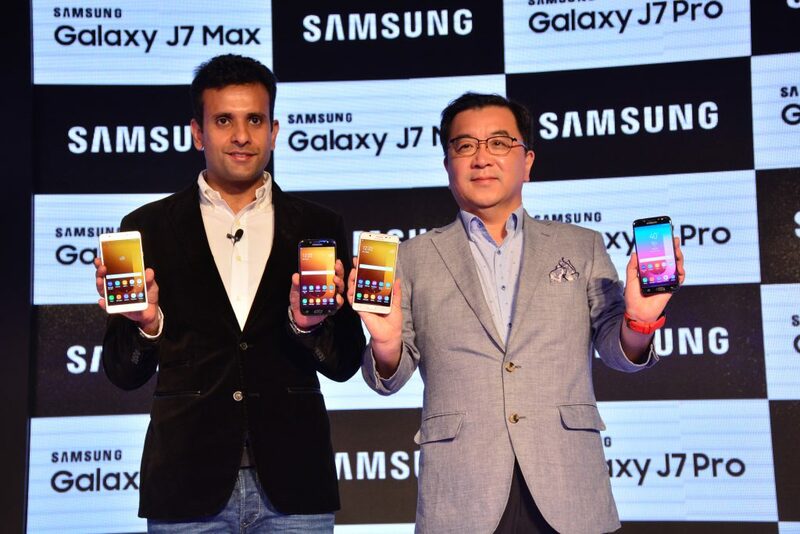 Samsung India has announced the launch of two new mid-range smartphones, the Galaxy J7 Max and Galaxy J7 Pro. The J Series is extremely popular in India, making up 30% of total smartphone sales in the country, according to Samsung. Its popularity seems to rest on the right balance between price and specifications, as well as market-specific features such as Ultra Data Saving and S bike mode. The Korean company will be hoping for more wins with the pair of new devices, which will be the first in India to include Samsung Pay. The Galaxy J7 Max features a 1.6 GHz Octa-core MediaTek chip, with 4GB of RAM and 32GB of storage, which is expandable up to 256GB with a microSD card. It sports a large 5.7" FHD TFT display and is powered by a 3,300mAh battery. It's sibling, the Galaxy J7 Pro, has Samsung's own Exynos processor, clocked at the same 1.6GHz, with only 3GB of RAM but 64GB of storage, which is only expandable to 128GB. The screen on the Galaxy J7 Pro is slightly smaller, at 5.5", also FHD, and uses sAMOLED technology, instead. It has a larger 3,600mAh battery but still manages to be 3mm thinner, at 7.8mm. Both devices have a metal unibody construction and will ship with an unspecified version number of Android Nougat. They'll also both have the same camera setups, 13MP (f1.7) with flash on the back and 13MP (f.19) with flash on the front. Samsung promises "stunning low light photos and bright selfies even in dimly lit areas." To accompany the lenses, Samsung is also introducing a new software feature it's calling Social Camera. This allows you to pin your favorite contacts and social media apps for instant sharing, right from within the camera app (see below image). The camera app also offers instant editing so you can add filters and stickers to your snaps before you share them. Available in retail stores from June 20th, the Galaxy J7 Max will be priced at INR 17,900 and come in black and gold. The Galaxy J7 Pro will come in the same colors, and it'll be available for INR 20,900 from the middle of July.